I loved you from the moment I laid my eyes on you. I still remember when I first held you in my arms 17 years ago. You were so tiny and vulnerable. I sang endless songs for you eventhough you’re already sleeping. You are such a special gift! Months passed and I got tired taking care of you, lol! I would be mad sometimes when it’s my turn to watch over you. But that was temporary. Everything changed when you started walking and growing fast. We all saw your word, first walk, your first of everything! You were a smart little girl – you were as talkative as Nate, and even more! I knew you’d grow up to be a talented lady. When I think of how time flies and how you blossomed into a lovely and spiritual lady, I can’t help but smile and thank the Lord for your life. I am amazed at how you set your life apart to be used for His glory. I’m proud that you’re NBSB – I’m proud of how you guard your heart. You are one-of-a-kind. You don’t know how happy I am that you’re here. Your presence helps me a lot. Thank you for helping us take care of Nate. I am confident that you will be a great mother to your kids someday. I am amazed at the things that you taught your nephew. I’ll make sure that he remembers all the good things you did to him. I am here to help you and support you always. And of course, correct you when I think you’re wrong. Don’t forget, you will always be our beloved “bunso/agot”. You have a special place in our heart. 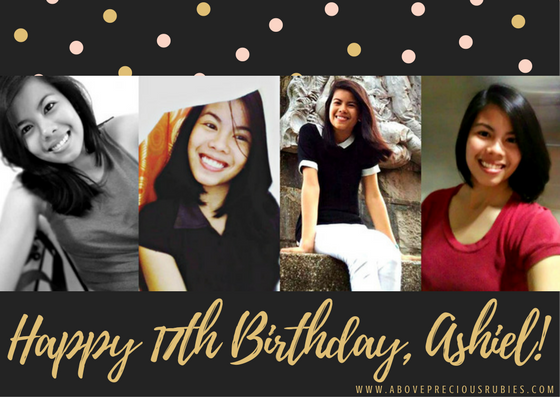 Enjoy your day today and happy 17th birthday! I love you, Lang! A happy birthday to you, Chen. You are lucky to have a sister na may anak na. Nakakapagpractice ka na mag-alaga ng anak. Ehehe. But seriously, enjoy your day and always be a blessing to others. aww… such a sweet message for your sister. Happy birthday to her and may God bless her more.